We apologize, but the 2016 Syrah is currently sold out in the Tasting Room. One of the few Syrah’s that you’ll find across the state, our Syrah is a medium bodied wine that touts a bouquet of plums, cloves, anise and olives with undertones of pork belly and vanilla. The signature flavors of our Syrah, the bright cherry, and cardamom spice, are accented by its chewy tannins which will soften over time. 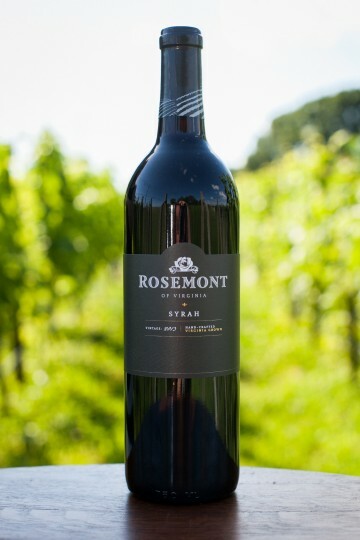 We age our Syrah in neutral oak, which helps to showcase the subtle spicy notes while enhancing the fruity aromas. It spent 16 months in oak before bottling. In 2016 we lost about 60% of our Syrah crop due to late freezes, resulting in a small production of only 152 cases. Duck, lamb, venison or any other game meats or hearty stews. Love your Syrah! I am working for Belle Mount Vineyards on May 30 at the Vintage VA wine festival. Will you bring some Syrah with you? I’d love to purchase 2-3 bottles. Tried this first at the Chesapeake Wine Festival in 2013 and just loved it. And yes, it hard to find a Syrah in Virginia. Excellent!